As a part of the new South Tailing Pond at the Suncor mine, a slurry cutoff wall was constructed to help isolate the mine from a nearby wetlands and Athabasca river. Groundwater from the mine was otherwise collected in wells and reused at the mine. It was estimated that the cutoff wall would not only protect the sensitive arctic environment, but save Suncor tens of millions of dollars in wells and pumping costs over the lifetime of the mine. Geo-Solutions teamed with the owner, engineer, and a local mining contractor to build the cutoff wall. The wall was a Soil-Bentonite (SB) slurry cutoff wall. 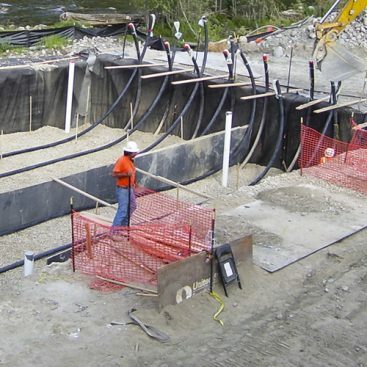 For the construction effort, Geo-Solutions provided construction and technical assistance services including specialty equipment and bentonite materials. 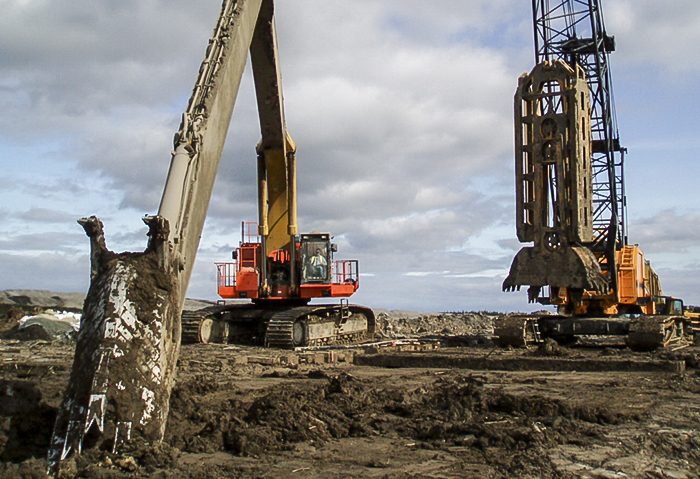 Specialty equipment included a long stick and long boom (capable of digging maximum 25m deep) for a 120 ton excavator (Hitachi 1200), bentonite slurry mixing plant, and a clamshell bucket. 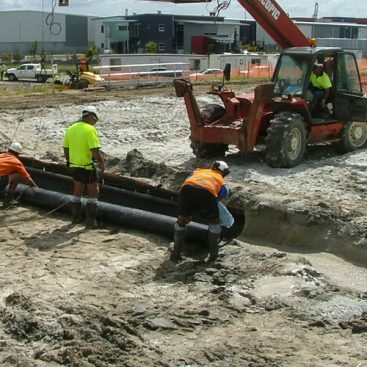 Geo-Solutions also was responsible for contractor quality control of the work. This project was one of the first large SB slurry walls ever constructed through the muskeg (a type of peat) that is common in northern Canada. The work platform was actually constructed in the winter to permit access over the muskeg. 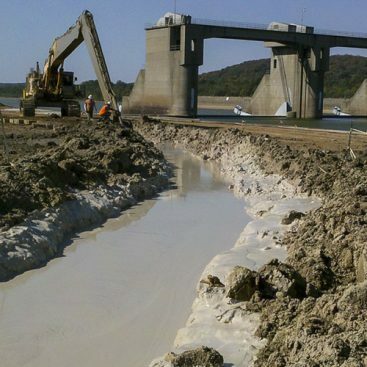 In the spring, the construction team started the slurry wall, with only limited warm weather available in the schedule. The slurry wall was constructed with a mixture of site soils, borrow clay and bentonite in order to provide a permeability of less than 1 x 10-7 cm/sec. Geo-Solutions and the project team were challenged by the difficulties of the remote location, availability of supplies and the muskeg, but successfully completed the project.